Luyties (LOOT-EASE), who was a member of the United States� Gold Medal team at the 1988 Seoul Olympic Games, has seven domestic titles. Luyties was inducted into the UCLA Hall of Fame in 1995 and his jersey (11) was retired in 1996 at Pauley Pavilion. Los Angeles� Player of the Year while attending Palisades High School, Luyties made a cameo appearance as himself in the Tri-Star Pictures release �Side Out!� in 1990. He is married (Lorrie). 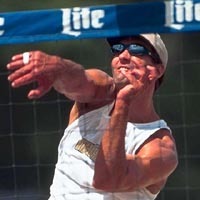 He is currently an assistant women�s volleyball coach at the University of Colorado.